A House decoration encompasses many things like setting up a modular kitchen, redesigning your bedroom and a lot more. We do all this to make ourselves more comfortable at home and even make our house look good at the same time, but at the same time we all have that one place in our house that we often overlook while decorating – it is the ‘living room’. The living room is basically a common space in the house where people often spend their most of the time, or it often referred to as ‘Hall’. People have many reasons for not decorating their living rooms. People who do not decorate their living rooms often give reasons such as, “it is a common area and what if the kids ruin the decoration? On the other hand, there are people who are left with the question such as how do we decorate our living room? The answer is pretty simple, as you can see, living rooms are large spaces, and any small kind of decoration like painting, portraits or busts may not look good, and the children may even break or ruin them. Adding more furniture will simply make the room look more crowded, and it will even be a pain in the back while cleaning. 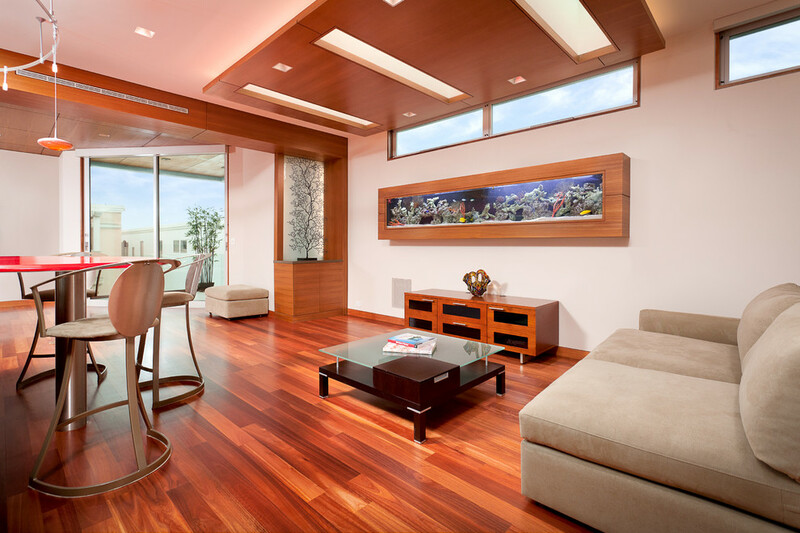 The best thing that you can do to make your living room look stunning is to add an aquarium. 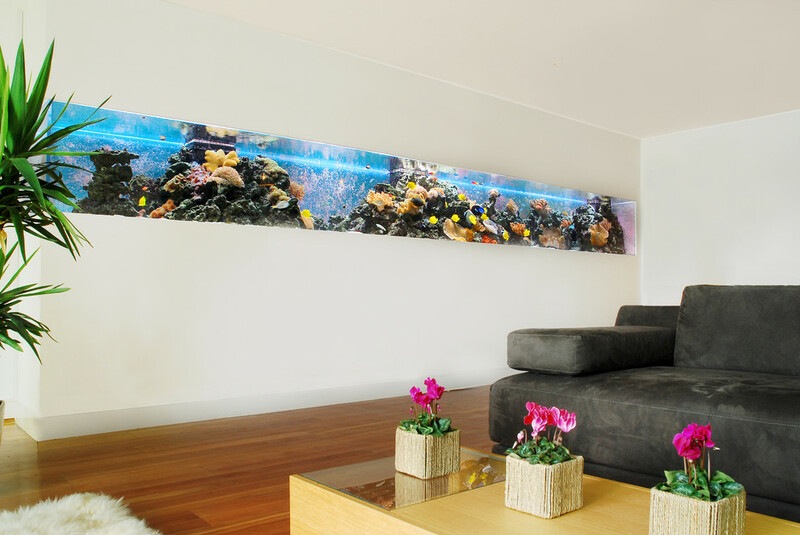 A panoramic aquarium is a long strip styled fish tank that can spread as long as you desire. The panoramic aquarium is ideal for covering overhead spaces or can be installed all around the room. 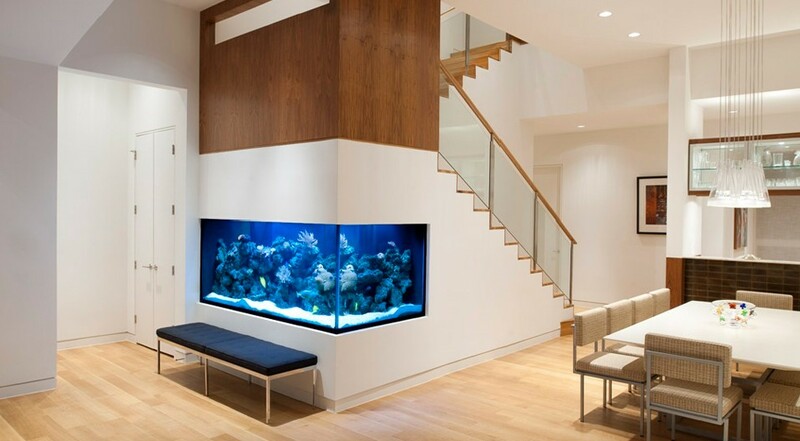 One of the most unconventional ideas is to turn that boring staircase wall into a beautiful aquarium. You can keep fishes of any size in this type of aquarium, and depending on the height of your staircase; you can extend it to any size you like. Nothing makes an aquarium look better than with objects that lie under the sea. Setting up this aquarium is not a tough job, all you need is a regular fish tank, and some old toys like ships, planes and you can also install a submarine shaped filter that will add to the ‘under the sea’ theme. On the table, on the wall, in the backyard etc. these are common ideas of an aquarium. Imagine an entire wall filled with fishes of all sizes moving to and from; the only thing that comes to a person’s mind is ‘marvellous’ when he/she sees the aquarium wall. The concept of aquarium wall is pretty simple; you just need to set up a fish tank vertically on that covers the entire wall. After installing the fish tank, you just need to fill it with water and add the fishes. 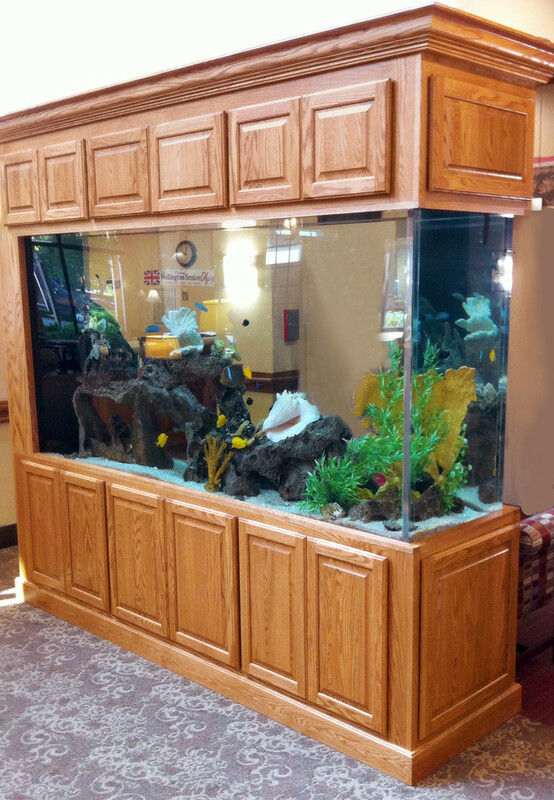 Aquariums can be one of the best things that can be added to the furniture, having an aquarium in the house is like having a low maintenance pet and a stylish interior decoration, i.e., two in one. Setting up an aquarium can be costly, and for people with ongoing Home Loans, it can be a far idea. In such cases, you can opt for a Top Up Loan from your current lender, or you can opt for a Home Loan balance transfer with NBFCs.